Freelancing requires a lot of patience, persistence and discipline. Dawn Papandrea (@DawnPapandrea), who specializes in personal finance, higher education, and family topics, started out as an editor about 15 years ago, and began freelancing on the side about 6 years ago. She then took the plunge and began freelancing full-time a year ago. Papandrea, who often uses ProfNet to help find sources for her stories, gave us a rundown of what her workday is like, the importance of not being distracted, taking time off, mistakes to avoid and much more. What’s the first work-related activity you do to start your day as a writer? I list out my deadlines, phone call appointments, follow ups I have to do, and from there, I prioritize my to-do list. Each day varies, but the bulk of my writing gets done early in the morning. From there, I do calls, marketing, etc. How do you balance the several assignments you have to finish, especially if you just write in the morning? I try to stay a day or two ahead on everything so that I have wiggle room if life gets in the way, or a source falls through. It’s funny that I’m a “morning writer” now, but I find that it’s when I can pound out those word counts. But, of course, on those multiple deadline days, I’m sometimes writing in the wee hours, too. What do you do when a source falls through? First off, I always try to have a backup on hand just in case. ProfNet helps with that. But for those last-minute source flake outs, I may resort to begging my friends for help and social media helps, too! What type of editorial calendar do you use, and how do you decide how many assignments to take on for the week? I use old school pen/paper for my calendar. I try to figure out how long assignments will take, and go from there. Do you ever have deadlines for the same day? Yes, deadlines do seem to travel in packs. Luckily, the bulk of the work is done before I actually sit down to write. Do you find it hard to take vacations as a full-time freelance writer? I joke around saying I’m the toughest boss I’ve ever had. But, I do make time for vacations and mental health days. Where do writers find brand content work? I do at least some work every day, but I *really* work 4-5 days per week. Meaning, I might have to do a quick phoner or write up a blog post over the weekend, but I try not to work Fri-Sun. Have you ever forgotten an assignment or mixed up a deadline? I’m a stickler for deadlines, but I’ve been guilty of marking the wrong date on my calendar once or twice. It happens. I do 95% of my work at the desk in my kitchen. It’s where I’m most productive. But, I do like getting out. What are the most common mistakes freelancers make, especially those just starting out? Common mistake: Not reaching for the stars. Start out with smaller pubs, but keep trying. One great clip can open doors. Also, not picking your battles carefully, and complaining about editors on social media. They will find out! How can someone with little experience start getting assignments? What do they do first? Starting out, you have to stand out with a great pitch. Editors are desperate for fresh ideas, packaged in a unique way. To improve your odds, study the publication and tailor the idea for it specifically. So many writers don’t do that. How do you develop your relationships with editors? First and foremost, by doing consistent good work, plain and simple. Make your editors’ jobs easier, and they’ll love you. Also, if there’s a chance to connect with editors in person or even on the phone, that goes a long way, too. In your experience, should you ever call an editor or is email really the best way to start communicating? Social media? Getting on the phone is appropriate to talk through a complex assignment. But for pitching, making intros, email all the way. I do like social media as well (esp. Twitter/LinkedIn), but be smart about it. Editors don’t want to feel stalked. How does a new freelancer ensure they’re getting paid appropriately? Is there somewhere to go to check for info like this? I think you have to work for rates that are right for you. Some might say not to take less than $X, but it’s all subjective. That’s not to say you should give your work away, but if something translates into a good hourly rate, go for it. I truly make a conscious effort to avoid distractions. Being disciplined is key for succeeding at this. How do you handle working with a child or little ones in the house who aren’t old enough for school or aren’t in day care? That’s tough. I did it up until my youngest started kindergarten this year. I worked during naps, late at night, etc. If it’s truly your business, though, it’s important to get help (or pay for help) so you can be productive. Confession: I still do conference calls in my bedroom with the door closed when the kids are home. Boys are noisy! 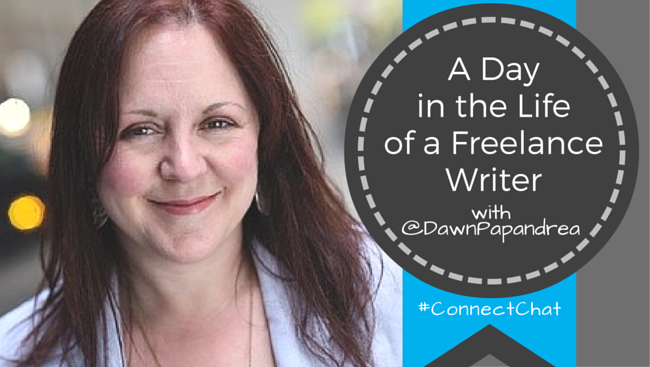 What should all writers, both new freelancers and those in the biz for a long time, be doing every single day? Marketing. You have to sell yourself every day. Whether it’s pitching, blogging, connecting via social, you have to market.